The upper Arkansas River courses through the heart of America from its headwaters near the Continental Divide above Leadville, Colorado, to Arkansas City, just above the Kansas-Oklahoma border. Max McCoy embarked on a trip of 742 miles in search of the rivers unique story. 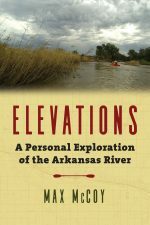 Part adventure and part reflection, steeped in the natural and cultural history of the Arkansas Valley, Elevations is McCoy’s account of that journey. The book will be released later this month. When did you first have the idea to write Elevations? Some years ago, my friend W.C. Jameson and I floated the Mulberry River in Arkansas. He suggested that someday we should undertake an adventure: kayaking the length of the Arkansas River—or at least the two-thirds that has water. Although we never got a chance, the idea stuck with me, and evolved. For a time, I was on the faculty of a writing workshop at Gunnison, Colorado, and the drive there from my home in eastern Kansas follows the river for several hundred miles—along Highway 50—from about Hutchinson to Salida. I would often stop at points along the river and think about all of the history at the water’s edge and ponder how the river had changed, and whenever I saw anybody in the river—a kayak, a canoe, a raft, just dipping their feet—that’s where I wanted to be, too. Later, I took a job at Emporia State, where I’m a professor now, and when the time came that I could submit an application for a sabbatical, I proposed the river project. I was granted a one- semester sabbatical in Fall 2013 to start the project, and it took another three years of episodic trips to complete the research. There was too much material to put the entire length of the river in one book, so I stopped at the Oklahoma Line—742 miles from the headwaters along the Continental Divide above Leadville, Colorado. The project had also evolved into more of a personal narrative, rather than just history and nature and culture, and that’s why it’s called a “personal exploration” in the subtitle. It sounds glib, but I set out to find a river and ended up finding myself. Can you describe your process of writing? How long did you spend working on the publication? How much time did you spend on the river. I followed the Hemingway method, I wrote until I bled. Anybody who says that writing is easy must be lying, because I’ve found that any writing worth putting your name to is just the opposite. And, there’s no guarantee that you’ll produce anything to equal Hemingway—or, in this case, Strayed or Krakauer or McPhee. You just bleed and stick to your research and do your damned best to be honest with yourself and the reader. And then, just sometimes, certainly not often enough, you come up with something you’re okay with putting your name to. I’m still too close to the writing of Elevations to know whether it’s any good. That’s for others to decide now. I came off the river the weekend before the General Election in November 2016, and then wrote steadily for the next few months. This was difficult because I was also working full time, so my days would be spent teaching journalism, and my nights spent writing. I got in the habit of writing late into the night during my days on daily newspapers, and not being a morning person, I’ve never been able to shake it. I already had perhaps 40,000 words written, but I ended up dropping some of that because of the structure that evolved for the book in the last six months or so of research. I finished the first draft at 3:12 p.m. Sunday, February 18, 2017 (I have a habit of recording these things). The draft was 120,000 words, which was somewhat longer than expected. Revisions, following peer review, also added another few thousand words. Just thinking about the amount of time I spent on the river, or near it, is a bit surprising to me now. It was dozens of trips, each of which ranged in length from a few days to a couple of weeks. As I’ve said, it was episodic in nature, but I was on the water or near it in every season. The hardest for me was winter, and I spent Christmas Day in 2015 along the river, in the mountains, and just a few miles from the spot where the explorer Zebulon Pike had spent a near-disastrous holiday a couple of hundred years before. I had good equipment, and expert advice, but spending a cold 14-hour night in a tent, alone with my thoughts, is not something I’d like to repeat. What is one thing you were most surprised to learn while working on the book? That the story was just as much about emotional distance as actual distance. I had this uncomfortable epiphany while spending Christmas Eve in the snow along the river in the mountains that I use work—researching and writing, lecturing and traveling—to create spaces between myself and those I love. Why? Because it’s easier to deal with emotions in the abstract than engage in the messy business of figuring out how you really feel about people and telling them. The unsurprising and dismaying thing I learned though writing the book is that, as human beings, we tend to repeat the mistakes of the past: Racism, genocide, demonization of immigrants, public policy that grants access to natural resources to only the wealthiest among us, trashing the environment in favor of short-term profits, the ease at which our authority figures lie and violate the public trust—and the capacity of the American public to be deeply in denial about the way things really are. Did your perspective of the relationship between the river and communities change at all? Yes. There are so many places where human beings have wrecked the river, from the federal Superfund site at Leadville down to where the river vanishes in western Kansas, that I became pessimistic early on. Much of the worst of this is hidden from view – you have to get out of your car and actually walk the dry bed at Cimarron Crossing or elsewhere to know just how much we’ve lost. Many communities seem ashamed, and perhaps rightly so, of how they’ve treated the river; fences block the view and barricades prevent access, and just walking down to the river requires something that feels like trespassing. Other cities, however, make the river an integral part of the landscape. I’m thinking here of the whitewater park at Salida, or the Riverwalk at Pueblo. The one place where we humans actually left things better than we found them was at Camp Amache near Granada, Colorado. Amache was a concentration camp for Japanese Americans during World War II, and the internees cared for the land without exploiting it. Imagine being illegally detained for the duration of the war, having your homes and businesses taken from you, and yet still feeling responsible for the land on which you’ve been imprisoned. What surprised you the most along your journey? How generous people were with their time and their expertise. Many people just immediately got what I was trying to do, but even those that didn’t were helpful and often kind. Sometimes I’d just approach a stranger and start asking questions, and they would open up. This happened, for example, at Pueblo, where a maintenance worker named Raymond who was watering the lawn dropped everything to give me a tour of Union Depot, including a glimpse inside the clock tower, with the city and the river stretching out below. Another example is Vince Marshall, a member of the Arkansas River Coalition at Wichita, who paddled many sections of the river with me, including my favorite part of the river in Kansas, below Great Bend. And, the whitewater guides I had in Colorado worked hard to keep me out of trouble. Both Brandon Slate and Reid Jackson saved my bacon more than a few times. And, they did it with grace and good humor. Water levels in the west are at a critical low point. What do you see as the biggest challenge to the people living along the Arkansas River? You’ve said it – water. Irrigation, compounded by public policy, threatens to make much of what was river in western Kansas into a desert. You would think we’d have learned the lesson about the importance of sustainable agriculture during the Dust Bowl, but apparently we did not. After World War II, advances in technology made it possible for us to pump water that had previously been too deep to reach. Agriculture boomed, and even better irrigation technology followed. For the middle decades of the Twentieth Century, it was thought this new source of water was inexhaustible. But, as we know now, that’s just not true – some areas of the High Plains aquifer, particularly in western Kansas, are dangerously low. The Kansas Geological Survey has excellent data on this, going back to the 1960s. We’re pumping the aquifer dry. There have been some coordinated attempts to reduce irrigation, with some success, but this is a case of delaying the inevitable. At the present rate of irrigation, agriculture in western Kansas is unsustainable. And the end game here is not far in the future… we’re talking decades. A related topic is the fate of the Arkansas River in western Kansas. Most communities between Great Bend and Garden City haven’t seen regular water in the river bed since the late 1970s. This is the result of a series of issues, including irrigation, changing topography, the long-litigated water compact between Kansas and Colorado, the right of “first use,” and snowmelt patterns in the Rockies that have been disrupted by climate change. Even if we stopped all irrigation now, it would take a long time for the river to come back. So long, in fact, that most studies say none of us alive now would be around to see it – and perhaps not even our children, or their children. From the very beginning, the river has been divvied up for profit. The gold miners blasted it apart at Leadville, it was diverted to make steel at Pueblo, it was pumped to grow crops in western Kansas, and for decades it was used as a dump for toxic chemicals in Wichita. We must instead recognize that the river belongs to all Kansans and Coloradans, that access to it is our birthright, and that we must treat it as the unique and irreplaceable resource that it is. If we don’t, we’re sure to lose it. What was the most exciting portion of traveling the Arkansas River? Browns Canyon. I flipped my kayak at a rapid called Zoom Flume and paid the price. It was the only time on the river that I was truly shaken. I’m not a great paddler, but I’m usually comfortable in the water, but that was one place where I thought there was a good chance I’d actually be hurt, or worse. The river swept me into a rather large rock, and I had bruises for weeks. It was my fault, of course, because after all, I was paddling my own boat—and my guide, Reid, had shown me how to run the rapid. I just screwed up and it’s a good thing he was there to help after. You could say I got the hubris beaten out of me. The next governor of Kansas. The river and the communities along it are snapshots of the problems the state faces today. To name a few examples: the Somali population at Garden City, the target of a bomb plot in November 2016 , should make us think about how we deal with immigration, refugees, and racism; the dry bed at Cimarron, representing the long stretch of the river in western Kansas where irrigation and public policy have pumped things dry and left the river dying, if not already dead; and the fact that the Arkansas is only one of three rivers in Kansas it is legal to paddle unless you get permission from all the landowners along the banks. Kansas has less public land, in terms of percentages, than any other state. Yet, we have this fantastic corridor that is designated as public, but in many areas is treated as a trash dump or a place to race your ATVs. For the areas that have water, access is a problem. More often than not, I found myself accessing the river in Kansas by dragging my kayak up or down many a filthy embankment beneath highway bridges. The best places to launch in Kansas, in my opinion, are in south Wichita and from the city park at Oxford. Man’s Search for Meaning by Viktor Frankl. I’ve read this several times before, but I return to it when I need encouragement. Frankl was a psychiatrist who was sent to Auschwitz and lost his parents, brother, and pregnant wife to the death camps. Yet, he managed to survive. His book is a memoir of his time in the camps, and explains his philosophy –that while we cannot escape suffering, we can choose our response to it, and that the key to life is not pleasure, but purpose. Max McCoy is professor of journalism and director of the Center for Great Plains Studies at Emporia State University. 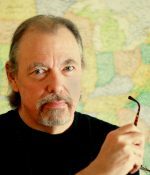 He has written a mystery series and works of historical fiction, three of which have won Spur Awards from the Western Writers of America.